EXO HOSTING Review 2019: Is EXO HOSTING a Good Hosting? An affordable Slovakian website hosting provider offering customizable and unlimited website hosting plans, domain registration, and SSL certificates. 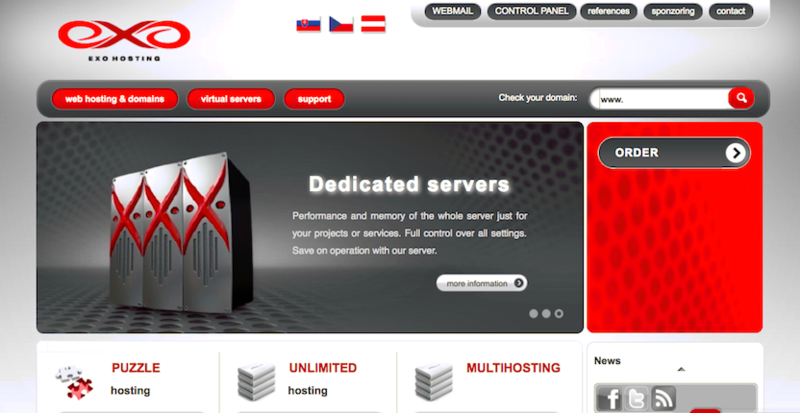 Founded in 2003, EXO HOSTING is a Slovakian website hosting provider. They currently host over 20,000 domains on more than 100 servers. Their customers are primarily based in Slovakia; however, they also have clients all across Europe. Their website is available in Slovakian, Czech and appears to be coming soon in Austrian. Their support is also available in English. EXO HOSTING is a full-service website hosting provider. They offer a variety of services including shared hosting, virtual private servers, dedicated servers, SSL certificates, and domain registration. EXO HOSTING offers the SiteReptile website building tool, which is a nice value-add for beginners. It comes with over 250 ready-made website templates to get you started, as well as an online demo so you can try before you buy. If that’s not enough, unlike many other website hosting providers, EXO HOSTING provides the website building tool and templates free of charge to customers with any of their website hosting plans. Another feature I really like about EXO HOSTING is their flexibility. They only offer three shared hosting plans: Puzzle, Multihosting, and Unlimited Hosting. However, all three plans can be adapted for your needs. You can, for example, increase or decrease the amount of webspace, email storage, email accounts, databases, and FTP accounts until you’ve built a package that perfectly fits your requirements. A small caveat: EXO HOSTING does offer an “unlimited” website hosting package. However, as with all web hosting companies, it’s impossible to provide unlimited services due to the physical constraints of servers. That said, for 90% of website owners, the provision is much, much more than you’ll ever require, so it could be a good option for those who are not certain of how much space and bandwidth they’ll require. EXO HOSTING has very affordable pricing compared to other local companies. They are also cheaper than many of their large international competitors. They offer several options for billing periods including monthly, quarterly, semi-annually and annually; however, there is no price reduction for longer terms, unfortunately. There is no free version or free trial. However, they do offer a 30-day money back guarantee. I also really like that they allow you to move between hosting plans by upgrading or downgrading at any time. Plus, to incentivize you to move over to them from another hosting provider, they offer nine months of free service. EXO HOSTING has excellent customer service options. They have live chat, telephone and email support, which are available in Slovakian, Czech, and English. Sadly, the support is not 24/7. Instead, it’s available 8AM to 8PM on weekdays and 10AM to 6PM on weekends. They have a FAQ section, but there’s no information on the webpage, which is slightly frustrating. That said, the rest of their website is very informative and in-depth, and they have very detailed guides available. EXO HOSTING offers a full suite of affordable web hosting services combined with excellent customer service. They work with a few large brands such as Sotheby’s and Avon and also provide free web hosting to non-profit organisations, civil associations, orphanages, research projects, and more. Wondering how EXO HOSTING stacks up against other Web Hosting companies? Enter any other Web Hosting company and we will give you a side-by-side comparison.